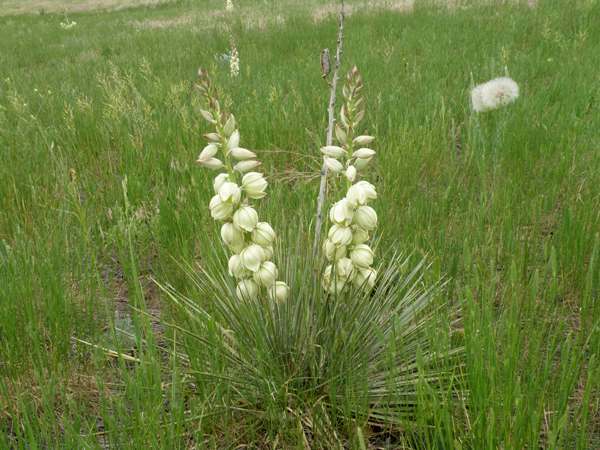 Above: Soapweed Yucca flowering in a meadow in early June. Yucca glauca is a robust plant growing to around a metre and a half in height. The tough woody flower stems emerge from a dense clump of long, narrow, sword-shaped leaves, and the flower stem persists long after the flowers have died back and often remain present when the new flowers appear the following year. The leaves are covered in a fine white powder which rubs off easily when touched. The long greenish-cream flowers consist of six sepals and six petals and form a dense raceme at the top of the flower stem. The flowers open in the evening and are pollinated by small moths which lay their eggs in the flowers' ovaries. The moth larvae feed on the flower seeds. American Indians used the seed pods of Yucca glauca as food, the tough fibrous leaves to make rope and the roots for making soap. Soapweed Yucca flowers from early June and likes well-drained, sandy soils. It can be seen in the plains and foothills of the Rocky Mountains. .The specimens on this page were photographed just outside Rocky Mountain National Park in June.